High Numbers of Stranding Guadalupe Fur Seals – Neptune 911! Researchers will try to determine if the die-off is a result of a disruption in the seal’s feeding patterns from a large-scale warming of the Pacific Ocean, Toby Garfield, an official with NOAA’s Southwest Fisheries Science Center, said Tuesday. “We think that warm water conditions have really changed the range of quite a few of the forage fish species that the fur seals would be going after,” he said. Garfield expects the high-pressure system to persist for a few more months, when El Nino, another ocean-warming phenomenon, could cause further problems. Of the 80 Guadalupe sea lions stranded so far this year, 42 were found dead, said Justin Viezbicke, a NOAA coordinator in Long Beach. From 2009 through 2014, the agency recorded only about 10 strandings per year. The spike “demands immediate response,” resulting in the designation, Viezbicke said. The majority of the stranded seals were pups born last year, but at least 4 were adult females, said Tenaya Norris, a scientist at the Marine Mammal Center in Sausalito, where most of the animals were rehabilitated. The center has responded to stranded fur seals since 1977, and before 2015, the highest number it has admitted in any other year is five, Norris said. SeaWorld in San Diego nursed other emaciated seals back to health. Guadalupe fur seals breed almost entirely on Guadalupe Island near Baja California, Mexico, more than 600 miles from where they are stranding in central California. Hunting brought the species to near extinction in the late 1800s, but it had been slowly recovering. The seal has been listed as threatened under the Endangered Species Act since 1967 and also is protected by the Marine Mammal Protection Act. The current population is estimated at more than 10,000 animals. 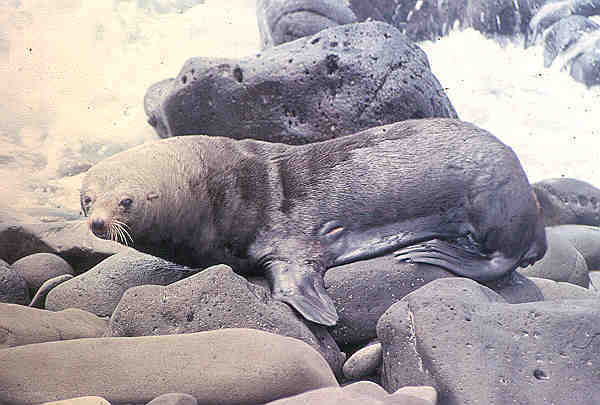 An unusual mortality event was declared in 2007 for Guadalupe fur seals in Oregon and Washington, according to NOAA.